PrintingForLess.com offers coupons and discounts in the form of alpha-numeric promotional codes. When you want to apply a discount coupon or promotional code to your order, please enter the alpha-numeric code in the "Promo Code" box at the bottom of the InstaPrice® section on the ordering page. Special Offers: Promotions and discounts to save you money. Bright Ideas: Marketing tips and design hints to help you get the most out of your marketing materials. Tech Tips: Recommendations for graphic file preparation, uploading, etc. Subscribe now to get the next issue of Printing Matters delivered to your inbox. You are able to manage your subscription at any time. Not sure we can print from your file? Send it to us and we will review it for free! Our pre-press experts will carefully review your file for about 50 different issues. We will call or email with suggestions on how to best prepare your document for optimum print results, generally within one business day. If your files are print-ready and do not require any additional preparation, you can immediately place your order referencing the file review number and avoid the need for additional file uploads. We are confident that you will be blown-away with the quality of our printing. Thorough pre-press preparation, quality paper stocks, state-of-the-art Heidelberg presses and a dedicated production crew combine for detailed, brilliant results. We want you to see these results yourself, to feel the different weights of paper, compare various product types and sizes. Request a free sample packet here. To receive the high-volume discount, place your order as usual and specify "Please apply high-volume discount" in the "Special Instructions" comment box. (Even if you don't request the discount, we'll still be happy to give it to you! The discount amount will be confirmed by a Technical Services Representative and you will receive an email receipt confirming the final discounted price. If you've had a great experience using PrintingForLess.com, we would truly appreciate your help in spreading the word. For those who prefer an extra incentive to give that valuable referral, we have an offer for you. Earn a $100 print credit - plus your friends save $40 too! Sign up for the PFL referral program.. The PrintingForLess Affiliate Program is a community of internet enthusiasts and entrepreneurs who promote PrintingForLess products and earn commissions while doing so. The Program is a great way to earn cash and introduce your website visitors to the quality printing services offered by PrintingForLess. 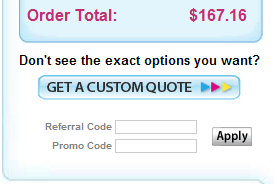 The PrintingForLess Affiliate Program compensates Affiliates with a commission for all initial and recurring orders placed within 90 days of the visitor's first click through to PrintingForLess.com. Affiliates receive monthly commission checks and are given access to powerful tools that help to optimize and Affiliates' efficacy and profits! You can find more information and sign up here.